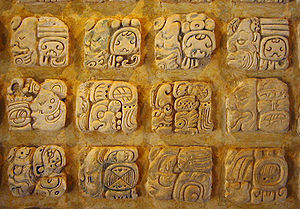 The 62 glyphs of the Cascajal block. Early Olmec ceramics show representations of something that may be codices, suggesting that amatl bark codices, and by extension well-developed writing, existed in Olmec times. It was also long thought that many of the glyphs present on Olmec monumental sculpture, such as those on the so-called "Ambassador Monument" (La Venta Monument 13), represented an early Olmec script. This suspicion was reinforced in 2002 by the announcement of the discovery of similar glyphs at San Andres. In September 2006, a report published in Science magazine announced the discovery of the Cascajal block, a writing-tablet-sized block of serpentine with 62 characters unlike any yet seen in Mesoamerica. This block was discovered by locals in the Olmec heartland and was dated by the archaeologists to approximately 900 BCE based on other debris. If the authenticity and date can be verified, this will prove to be the earliest writing yet found in Mesoamerica. Another candidate for earliest writing system in Mesoamerica is the writing system of the Zapotec culture. Rising in the late Pre-Classic era after the decline of the Olmec civilization, the Zapotecs of present-day Oaxaca built an empire around Monte Alban. On a few monuments at this archaeological site, archaeologists have found extended text in a glyphic script. Some signs can be recognized as calendric information but the script as such remains undeciphered. Read in columns from top to bottom, its execution is somewhat cruder than that of the later Classic Maya and this has led epigraphers to believe that the script was also less phonetic than the largely syllabic Maya script. These are, however, speculations. The earliest known monument with Zapotec writing is a "Danzante" stone, officially known as Monument 3, found in San Jose Mogote, Oaxaca. It has a relief of what appears to be a dead and bloodied captive with two glyphic signs between his legs, probably representing his name. First dated to 500–600 BCE, this was earlier considered the earliest writing in Mesoamerica. However doubts have been expressed as to this dating and the monument may have been reused. The Zapotec script went out of use only in the late Classic period. A small number of artifacts found in the Isthmus of Tehuantepec show examples of another early Mesoamerican writing system. They can be seen to contain calendric information but are otherwise undeciphered. 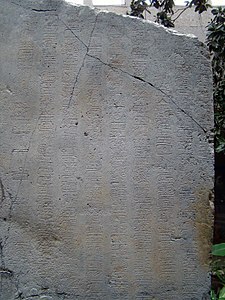 The longest of these texts are on La Mojarra Stela 1 and the Tuxtla Statuette. The writing system used is very close to the Maya script, using affixal glyphs and Long Count dates, but is read only in one column at a time as is the Zapotec script. It has been suggested that this Isthmian or Epi-Olmec script is the direct predecessor of the Maya script, thus giving the Maya script a non-Maya origin. Another artifact with Epi-Olmec script is the Chiapa de Corzo stela which is the oldest monument of the Americas inscribed with its own date: the Long Count on the stela dates it to 36 BCE. In a 1997 paper, John Justeson and Terrence Kaufman put forward a decipherment of Epi-Olmec. The following year, however, their interpretation was disputed by Stephen Houston and Michael D. Coe, who unsuccessfully applied Justeson and Kaufman's decipherment system against epi-Olmec script from the back of a hitherto unknown mask. The matter remains under dispute. In the highland Maya archaeological sites of Abaj Takalik and Kaminaljuyú writing has been found dating to Izapa culture. It is likely that in this area in late Pre-Classic times an ancient form of a Mixe–Zoquean language was spoken, and the inscriptions found here may be in such a language rather than a Maya one. Some glyphs in this scripts are readable as they are identical to Maya glyphs but the script remains undeciphered. The advanced decay and destruction of these archaeological sites make it improbable that more monuments with these scripts will come to light making possible a decipherment. Maya writing is attested from the mid-preclassic period in the center of Petén in the Maya lowlands, and lately scholars have suggested that the earliest Maya inscriptions may in fact be the oldest of Mesoamerica. The earliest inscriptions in an identifiably Maya script date back to 200–300 BCE. Early examples include the painted inscriptions at the caves of Naj Tunich and La Cobanerita in El Petén, Guatemala. The most elaborate inscriptions are considered to be those at classic sites like Palenque, Copán and Tikal. The Maya script is generally considered to be the most fully developed Mesoamerican writing system, mostly because of its extraordinary aesthetics and because it has been partially deciphered. In Maya writing, logograms and syllable signs are combined. Around 700 different glyphs have been documented, with some 75% having been deciphered. Around 7000 texts in Maya script have been documented. Maya writing first developed as only utilizing logograms, but later included the use of phonetic complements in order to differentiate between the semantic meanings of the logograms and for context that allows for syllabic spelling of words. The Mixtec writing emerged during the 13th century, much later than the systems previously mentioned. Mixtec is a semasiographic system that was used by the pre-Hispanic Mixtecs. Many of its characteristics were later adopted by the Mexica and Mixteca-Puebla writing systems. The origin of the Mixteca-Puebla is the subject of debate amongst experts. The Mixtec writing system consisted of a set of figurative signs and symbols that served as guides for storytellers as they recounted legends. These storytellers were usually priests and other members of the Mixtec upper class. Mixtec writing has been categorized as being a mixture of pictorial and logographic, rather than a complete logogram system. Mixtec writing has been preserved through various archaeological artifacts that have survived the passage of time and the destruction of the Spanish conquest. Among these objects are four pre-Hispanic codices written on tanned deer skin covered with stucco. These codices are read in boustrophedon, a zigzag style in which the reader follows red lines that indicate the way to read. Most of the current knowledge about the writing of the Mixtecans is due to the work of Alfonso Caso, who undertook the task of deciphering the code based on a set of pre-Columbian and colonial documents of the Mixtec culture. Although the Mixtecs had a set of symbols that allowed them to record historical dates, they did not use the long count calendar characteristic of other southeast Mesoamerican writing systems. Instead, the codices that have been preserved record historical events of this pre-Columbian people, especially those events related to expansionism in the era of Ocho Venado, lord of Tilantongo. Two other potential writing systems have been found in Mesoamerica. The Tlatilco cylinder seal was found during the time frame of the Olmec occupation of Tlatilco, and appears to contain a non-pictographic script. The Chiapa de Corzo cylinder seal found at that location in Mexico also appears to be an example of an unknown Mesoamerican script. After the collapse of the classic Maya civilization, the Maya glyphic system continued to be used, but much less so. Post-classic inscriptions are found at the Yucatán peninsula in sites such as Chichén Itza and Uxmal but the style is not nearly as accomplished as the classic Maya inscriptions. Other post-classic cultures such as the Aztec did not have fully developed writing systems, but instead used semasiographic writing although they have been said to be slowly developing phonetic principles in their writing by the use of the rebus principle. Aztec name glyphs for example do combine logographic elements with phonetic readings. ^ Macri, Martha J. (1996). "Maya and Other Mesoamerican Scripts," in The World's Writing Systems. England: Oxford. p. 172-182. ^ L Campbell; Kaufman, and T. (1985). "Maya Linguistics: Where Are We Now?". Annual Review of Anthropology. 14 (1): 187–198. doi:10.1146/annurev.an.14.100185.001155. ^ Kubler, George (1974). "Review of Picture Writing from Ancient Southern Mexico: Mixtec Place Signs and Maps". American Anthropologist. 76 (3): 670–672. doi:10.2307/674740. JSTOR 674740. ^ Pohl, John M. D. (2005). "The Griffin Fragment: A Mixtec Drinking Vessel Portraying the Pace Sign for 'Hill of the Turkey". Record of the Art Museum, Princeton University. 64: 81–90. ^ Jansen, Marten (1982). Huisi Tacu. Estudio interpretativo de un libro mixteco antiguo. Codex Vindobonensis Mexicanus I. Amsterdam: Centro de Estudios y Documentación Latinoamericanos. ^ Fagan, Brian (2014). The Great Archaeologists. New York: Thames & Hudson. pp. 110–114. ISBN 978-0-500-05181-8. ^ López Ramos, Juan Arturo (1987). Esplendor de la antigua Mixteca. México: Editorial Trillas. pp. 99–109. ISBN 968-24-2613-8. ^ Kelley, David H. (1966). "A Cylinder Seal from Tlatilco". American Antiquity. 31 (5): 744–46. Michael D. Coe and Justin Kerr, The Art of the Maya Scribe, Thames and Hudson. 1997. Martinez, Ma. del Carmen Rodríguez; Ponciano Ortíz Ceballos; Michael D. Coe; Richard A. Diehl; Stephen D. Houston; Karl A. Taube; Alfredo Delgado Calderón; "Oldest Writing in the New World", in Science, 15 September 2006, vol. 313, no. 5793, pp. 1610–1614. Nielsen, Jesper, Under slangehimlen, Aschehoug, Denmark, 2000. Sampson, Geoffrey. Writing Systems: A Linguistic Introduction. Hutchinson (London), 1985. Corpus of Maya Hieroglyphic Inscriptions Program, at the Peabody Museum of Archaeology and Ethnology, Harvard University. Corpus of Maya Hieroglyphic Inscriptions, volumes 1–9. Published by the Peabody Museum Press and distributed by the Harvard University Press.